Explanation: It does look like a flying saucer, but this technologically advanced structure is not here to deliver the wise extraterrestrial from the scifi classic movie The Day the Earth Stood Still. It is here to advance our knowledge of the Universe though. 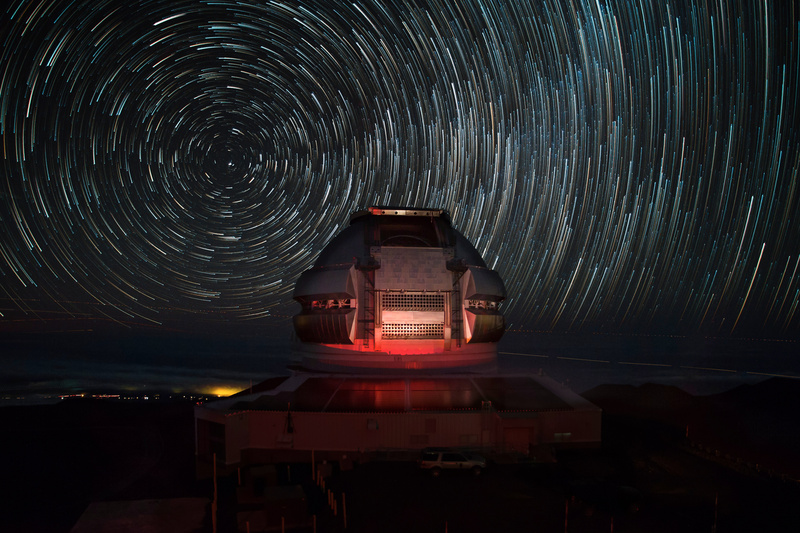 Shown sitting near the top of a mountain in Hawaii, the dome of the Gemini Observatory North houses one of two identical 8.1-meter diameter telescopes. Used with its southern hemisphere twin observatory in Chile, the two can access the entire sky from planet Earth. Constructed from 85 exposures lasting 30 seconds each with camera fixed to a tripod, the image also clearly demonstrates that the Earth did not stand still. Adjusted to be brighter at the ends of their arcs, the concentric star trails centered on the North Celestial Pole are a reflection of Earth's rotation around its axis. Close to the horizon at Hawaiian latitudes, Polaris, the North Star, makes the shortest star trail. The fainter denser forest of star trails toward the right is part of the rising Milky Way.